I helped to run a summer day camp at my kiddos’ school this summer. There were six outstanding teenage volunteers who helped me out. I made six of these cards; one for each volunteer. I wanted to give the cards a campy feel, so I used tiny images from a lot of different Lawn Fawn Stamp Sets. Extra Details: I started with a full sheet of water color paper. I stamped the gumball from Sweet Smiles in a loose grid. I filled the gumballs in with the faces and used a Sharpie to add the hair. I filled in the open spaces with small images from a number of different stamp sets. Using Distress Inks, I water colored everything in. I didn’t stress too much about staying in lines; I think it added to the camp feel. While the water color panel was drying, I made the card bases. I started with a kraft A2 sized card base. I stamped a wood grain pattern on the front of each card base. I cut the water color piece into six pieces, approximately 3 inches by 5.5. I ran each strip through my die cut machine to add the cross stitched detail to the edges and die cut the word Thanks. Lastly, I adhered the water color panel to my card bases, making sure to include the little pieces from the inside of the letters. Today, I was having fun playing with my Distress Inks. 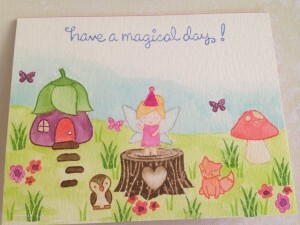 This ended up as a birthday card because that is what I need to replenish in my stash. 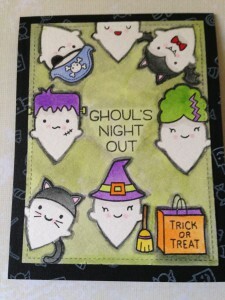 Extra Details: I started with a panel of water color paper that I die cut with a stitched rectangle die. 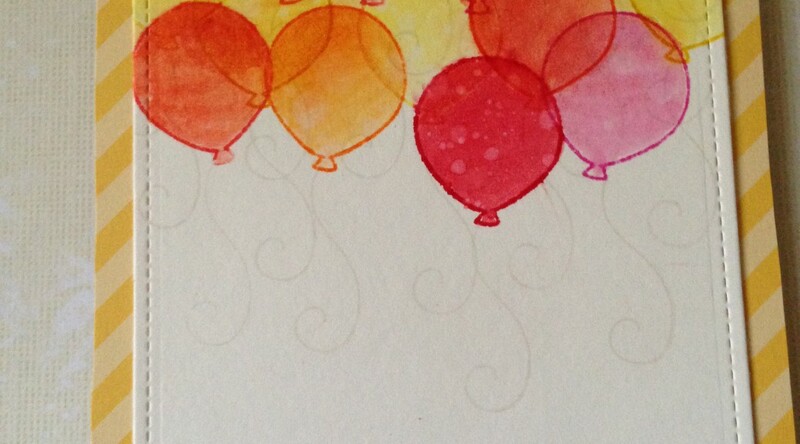 After that, I stamped my balloon outlines using Distress Inks. I didn’t worry about masking anything because I was hoping the balloons would look translucent in the end. After all the balloon outlines were stamped I added more color using the same Distress Inks as water color. I worked from the lightest color to the darkest color. I added some water droplets for interest. 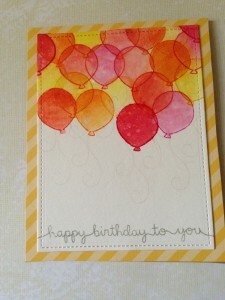 I stamped the balloon strings in Simon Says Stamp Fog ink. The sentiment is stamped in Simon Says Stamp Smoke Ink. I covered the front of my card base with some Lawn Fawn patterned paper and added the stamped panel on top. Distress Inks in Abandoned Coral, Candied Apple, Mustard Seed, Picked Raspberry, Ripe Persimmon, Spiced Marmalade, and Squeezed Lemonade. 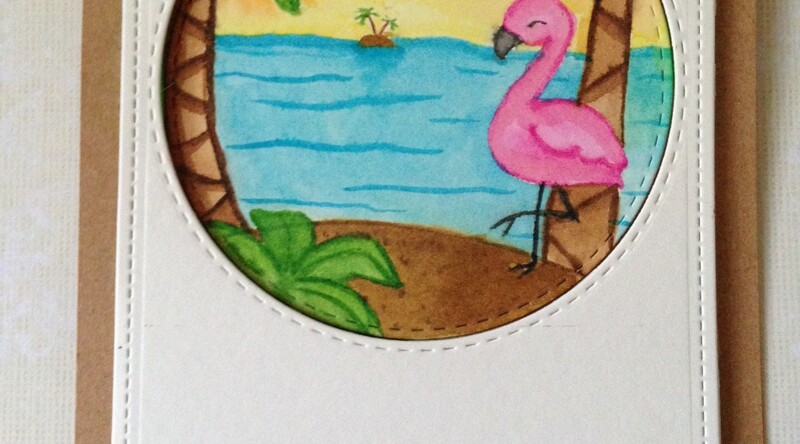 I just bought the Lawn Fawn Flamingo Together and Plan On It stamp sets. 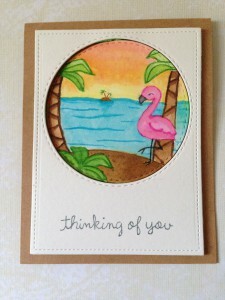 As soon as I opened my package, I knew I wanted to make a card with both the flamingo and the tiny island. 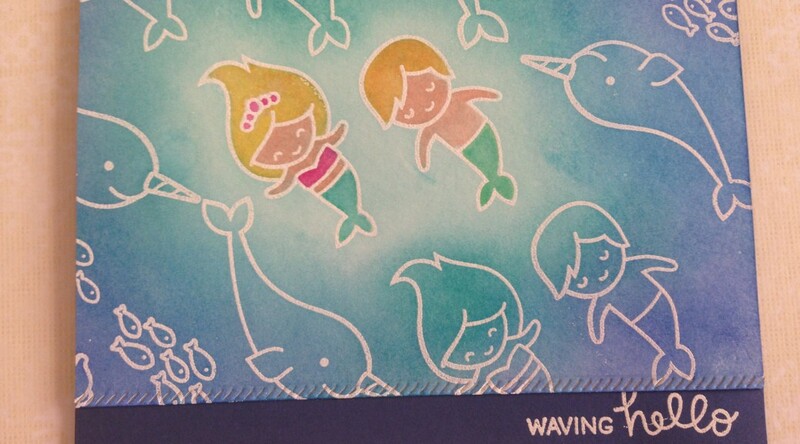 Extra Details: I started by die cutting a stitched rectangle of water color cardstock. I cut a stitched circle from the panel and used this to create my scene. I stamped everything in Antique Linen Distress Ink and tried no line coloring again. I used Distress Inks to add all of the colors. 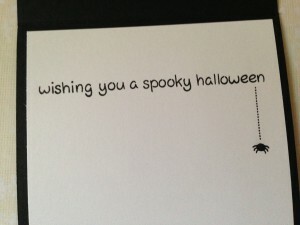 I used a grey ink for the sentiment because I wanted to give the card a softer feel. After the water colored circle was dry, I assembled my card. I adhered the circle flat to the kraft card base. I popped the rest of the stitched rectangle up on fun foam. Distress Ink in Mustard Seed, Spiced Marmalade, Abandoned Coral, Brushed Corduroy, Vintage Photo, Ground Espresso, Mowed Lawn, Twisted Citron, Picked Raspberry, Black Soot, Hickory Smoke, Mermaid Lagoon, and Antique Linen. 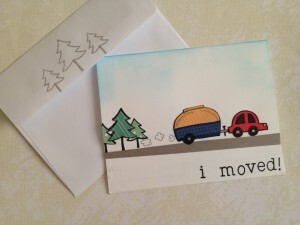 My grandmother recently moved and I wanted to give her some change of address cards as a house warming gift. 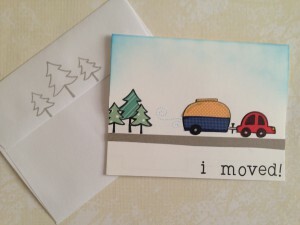 I had just bought the Happy Trails stamp set and thought I could make the camper a moving trailer. I did some experimenting and found that my idea worked. I, originally, started by coloring the images in with markers, but that idea changed. The Lawnscaping blog posted their new challenge (#135: Patterned Palooza) and I wanted to play with paper piecing. I ended up with 30 finished cards; 24 with paper piecing and 6 with the original coloring. Extra Details: I started by carefully inking up the camper stamp. I only inked the edges. Once stamped, any missing areas I filled in with a thin black Sharpie. 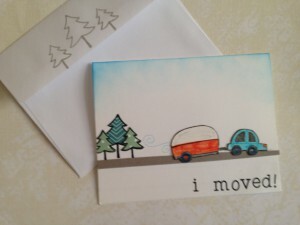 I stamped the “camper” on two colors of patterned paper. 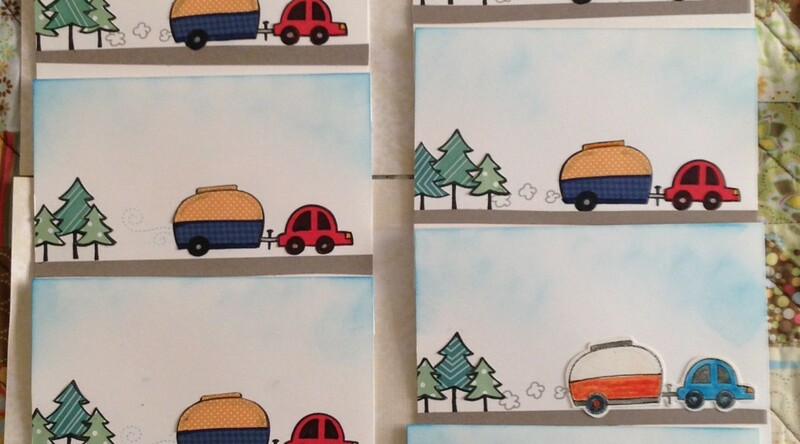 Once, I had all the “campers”, cars, and trees stamped, I fussy cut them out. I painted all of the cut edges with a black marker to hide any cutting errors. Once the cutting was complete, I created by card bases. Using a ruler, I drew a light pencil like as a guide. 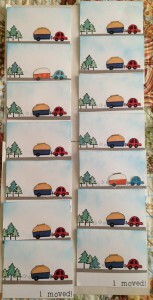 I stamped the car, camper and trees on each card base. I did not worry about the door or windows on the camper this time because I knew I would be covering them up. I also stamped all of the sentiments at this time. I adhered the thing grey road down first. I started with half inch strips of grey card stock for the roads, but they were too wide and looked to straight. So using the largest scissors I own, I cut the strips roughly in half. The imperfect cutting looks more natural to me. I really like the way the roads looked on the finished cards. Then I glued all of the paper pieces down to the card bases. Once the glue was dry, I added the wind or smoke puffs. This completed the cards. I added some trees to the envelope flaps to added interest. I saw the new Lawnscaping Challenge, all about patterns, and this idea popped into my head. I wanted my main images to be part of the pattern but still stand out. Extra Details: I started with a panel of water color paper. I stamped and white heat embossed all of the images on the panel. Once that was cool, I ink blended the blue background with Distress Inks. I didn’t worry about masking my main images. I did only cover them with the lightest color of distress ink. Once the ink blending was done, I used water to bleach out my main images. It took two or three rounds of applying water and dabbing it off, before I was completely happy with how white my images where. 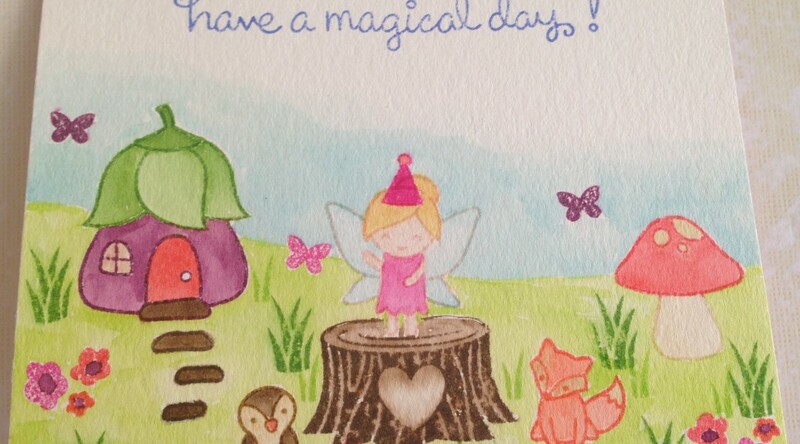 Then using more Distress Inks, I water colored the images. I ended up really liking the light blue underneath all of the colors I added. 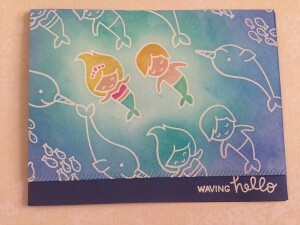 I think it made my mermaids look like they are under the water. Once everything was dry, I added the stitching detail to the bottom edge of the panel. 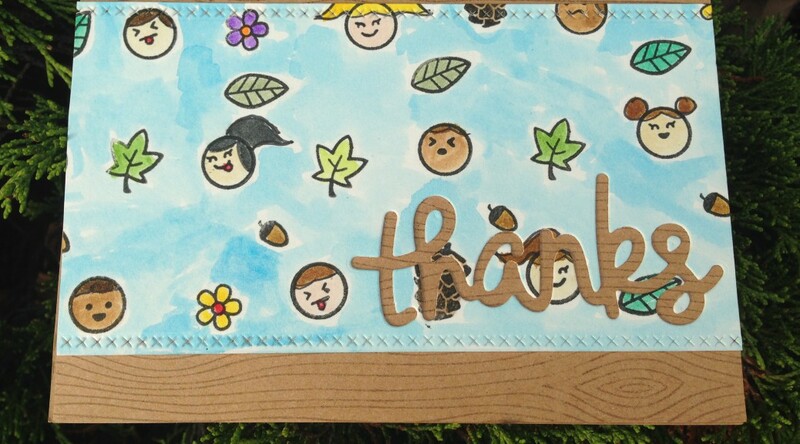 I heat embossed the sentiment on the dark blue card base, adhered the inked panel and was done. Distress Inks in Blueprint Sketch, Cracked Pistachio, Mermaid Lagoon, Peacock Feathers, Picked Raspberry, Scattered Straw and Tattered Rose. 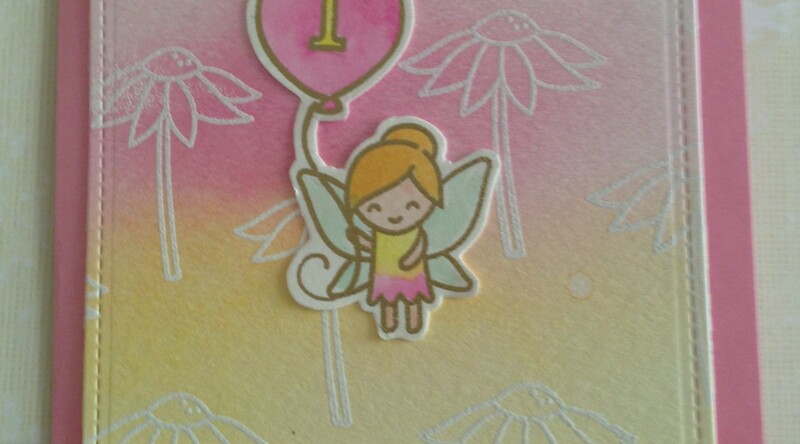 I needed a birthday card for a sweet little girl who is just turning one. I had a lot of fun with card. 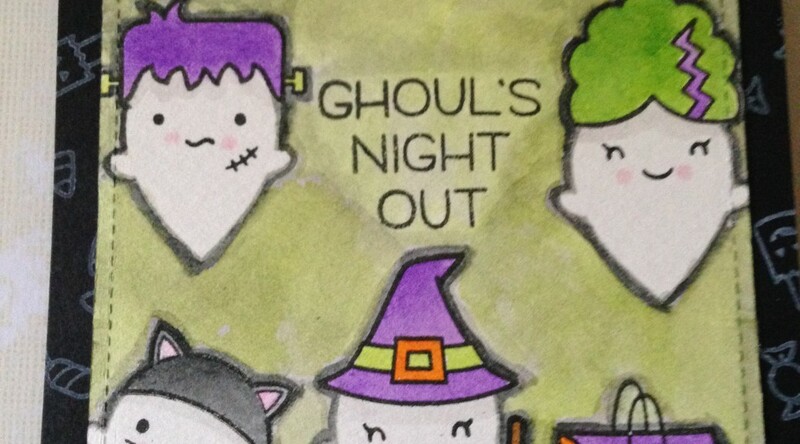 I stamped the scene using Distress Inks to give it a no line coloring feel, but without all the really hard work. Extra Details: I started with a 4.25 x 5.5 panel of water color paper. Using Distress Inks, I stamped all of the images. I smooshed more Distress Ink on my acrylic block to finish the water coloring. After all the images where complete, I filled in the background with a light wash of Twisted Citron and Tumbled Glass Distress Inks. Once the panel was dry, I adhered it to a light pink card base and was done. I needed a birthday card for a sweet little girl who is just turning one. I used a lot of heat embossing on this card I really like the way it turned out. 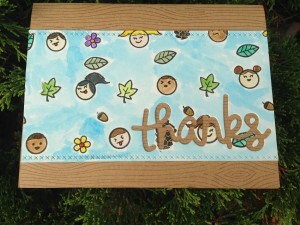 Extra Details: I started by stamping and white heat embossing the daisies on the background panel. I ink blended Picked Raspberry and Squeezed Lemonade on this panel. I tried to keep the ink blending soft and light. 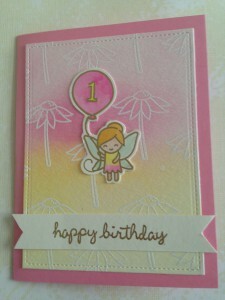 I stamped and heat embossed the fairy, sentiment and balloon with gold embossing powder. I used Distress Inks to water color the fairy. Once dry, I fussy cut out the images and sentiment. I adhered everything flat on a light pink card base.